I was reading an article in a skin care publication the other day and came across some intriguing information about Argan oil. What piqued my interest was that all argan oil sold today is produced by a co-op of women belonging to the Berber tribe in Morocco. The profits from sales of the oil help provide education and healthcare for the entire community. The co-op has also established an ecosystem reforestation project so that the supply of argan oil will not run out. 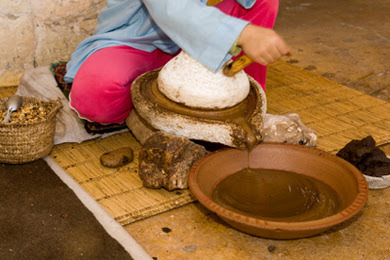 The oil is derived from the kernels of the Argan tree, which is one of the rarest trees in the world. It was brought to the brink of extinction by clear cutting and it's use for fire wood. The argan tree is endemic to Morocco, and due to its small and very specific growing area, the oil is referred to as "liquid gold". 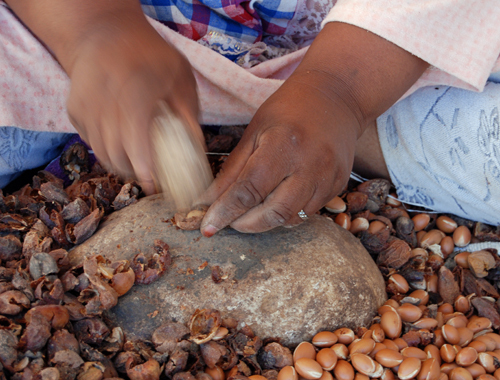 The women of the Berber tribe cold press the argan kernels to retrieve the oil. It's used cosmetically as well as in cooking. The oil is incredibly rich in vitamin E, phenols, carotenes (vitamin A precursor), squalene, and essential fatty acids. What that means for skin care is you have a non greasy, scar healing, anti aging, blemish preventing, anti-inflammatory powerhouse oil. Its so rare to come across anything that works for every skin type, but this oil does it and is such a multi-tasker. You can use it as a hair serum, to soften cuticles, to treat eczema, psoriasis, hypersensitivity, and is safe for use on infants. I've compared it to the most expensive face creams, and this simple oil has higher concentrations of the most sought after active ingredients on the market. You have to be a bit picky when buying argan oil. I've found it hard to find 100% pure argan oil. I found many products claiming to be pure argan oil but the dead give away that they aren't is the color. Pure argan oil is a clear, bright acid yellow and will have a strong smell. After much searching, I found Argan Oils Company and this is the real thing. I encourage you all to give it a try and tell me what you think. 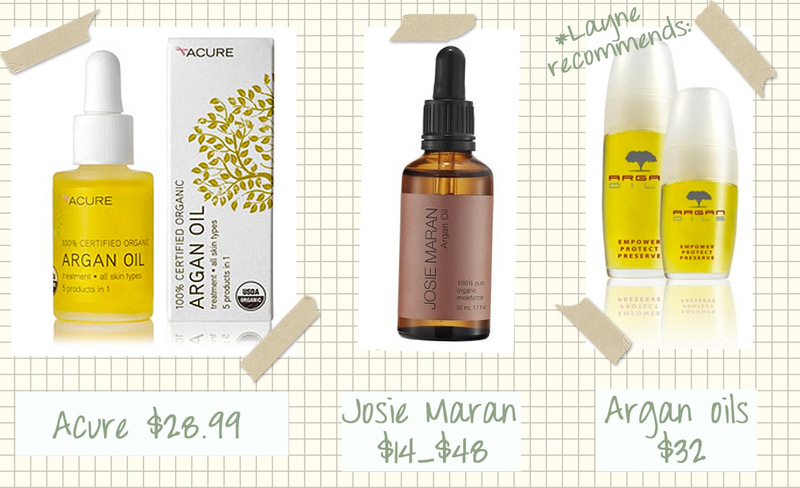 Editor's note- I started using Argan Oil on my face, every night, after reading this post. I adore this stuff and highly recommend it. I've been using argan Oil for quite sometime now and both my skin and hair is loving it. Def a must thanks for the post. I've heard about this for hair and am dying to try it. I've been using Moroccan Oil for years but I haven't heard of this. Thanks for the tip! I have used Moroccan Oil and it was great. A relative picked up some on a visit their for me. It was quite a treat. definitely going to hunt down some of this, it sounds AMAZING. Thanks for the post! 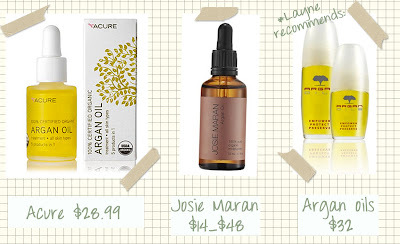 Haven't tried the Argan oil yet but want too! 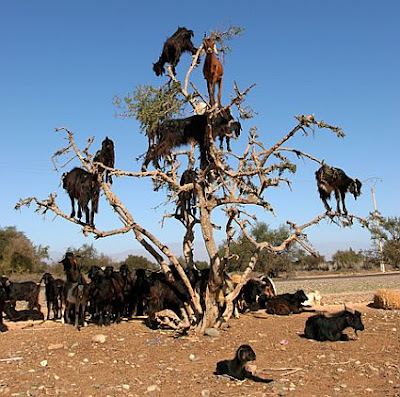 I especially love the pic of the goats though! It made me laugh so hard. sounds fantastic, especially the oil produced by the cooperative. I must have a look into it. 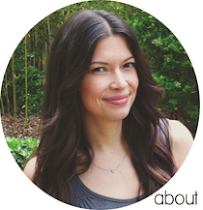 I always love seeing posts on organic skin care Christina. I used to get in trouble for writing about it because it wasn't chic enough and then it became all the rage. Now that green is less trendy, it's nice to see people still care about what they put on their skin. I used up a bottle of Josie Maran last year and thought it was really great! Fouad Nassiri- thank you for the information and the recommendation. We will definitely check it out! i'd love to try it but frankly a lil worried about the smell. i'm very sensitive about such things. Soo interesting..I had no idea..I use it in my hair and love how to smells. Your blog rocks btw and I am not following you! Cant wait to read more..
thank you anon. it has been fixed! I love this stuff! I found Atri Artisans 100% Organic Argan oil especially effective after trying many different Argan oils. It's hair, skin and face care all in one!